In the past few decades, China has put substantial efforts into liberalising its trade and economy that accelerated after its accession to the World Trade Organisation (WTO) in December 2001. In this period China has significantly reduced its tariffs on manufacturing imports. However, the proliferation of non-tariff measures (NTMs) imposed by China has made it the country notifying the second largest number of technical barriers to trade (TBTs) to the WTO after the United States. 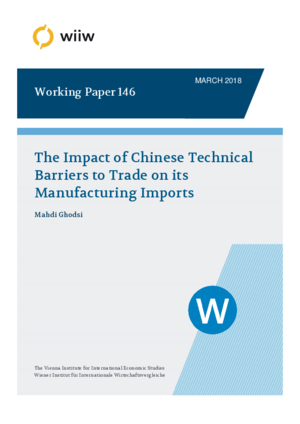 This paper investigates the impact of Chinese TBTs and tariffs on the imports of manufacturing products at the 6-digit level of the Harmonised System (HS) during 2002-2015. Heterogeneity of exporting firms, sample selection bias, multilateral resistances, and endogeneity bias are controlled for according to the recent strands of gravity modelling. Results suggest a positive impact of tariff reduction and the imposition of TBTs by China on its import values and quantities. The impact of Chinese TBTs is also differentiated across exporting countries. Since import prices are not significantly affected by TBTs, the imposed standards and regulations embedded in these trade policy measures allowed the economy to gain access to more products from the more developed economies, leading to trade creation.